Fort Bonifacio, home to over a dozen high rises and commercial complexes, possesses a colorful past. Previously an American military reservation during the colonial period, Fort McKinley was the headquarters of the Philippine Division which was practically the entire Philippine department of the U.S. Army. Numbering around 10,000 soldiers, the troop, which went by the name of Philippine Scouts, were composed mostly of Filipinos. Three years after gaining independence from the Americans, Fort McKinley was returned to the Philippines and was renamed Fort Bonifacio, in tribute to the revolutionary exploits of Andres Bonifacio, who organized what is effectively the first Philippine Armed Force. As headquarters of the Armed Forces of the Philippines, Fort Bonifacio was home to the major services such as the Army, Navy, Air Force, Marines, and the Scout Rangers. Aside from the numerous barracks set up for the soldiers, Fort Bonifacio also had an officer’s golf course, as well as commissaries and R&R areas for the enlisted men. Fort Bonifacio is also the final resting place of soldiers as it holds the Libingan ng mga Bayani, and the Manila American Cemetery and Memorial. 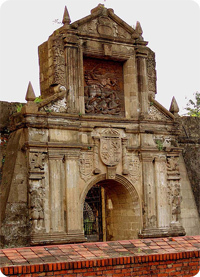 The Libingan holds the remains of more than 30,000 Filipino soldiers from the infamous Death March of Bataan, the battle of Corregidor, and other battles fought during World War II. However, Philippine Presidents, National Artists and other pre-eminent Filipinos have lately been laid to rest here as well. The American Cemetery on the other hand holds the remains of US servicemen who died in battle in various military encounters in the Asia Pacific region during the Second World War. In what has become an ironic twist, the cemeteries and memorials that were dedicated to the deceased heroes were also the same that would provide the basis of conflict of the territorial claims of two local governments. Claimed by both Makati and Taguig in whole or in part, it was finally resolved in 2003 when everything within the Fort Bonifacio boundary was ruled to be within the jurisdiction of the city of Taguig. During the time that it was called Fort McKinley, to the time it was known as Fort Bonifacio, the surrounding area evolved towards what is now the country’s financial district. Makati, home to most of the country’s top 500 corporations, outgrew every other town and city in the country and went on to eventually become what it is today. Due to its proximity to Makati, the land value of Fort Bonifacio zoomed to astronomical levels. Eventually it was more valuable to the national government if it was converted to real estate rather than kept as a military camp. And luckily because of this, Fort Bonifacio is now the best alternative for offices and high end residences. And the rest is now history.